A large dinosaur fossil has been found by a pipeline installation crew, during the works, on Southwest of Spirit River, Alberta (province of Canada). 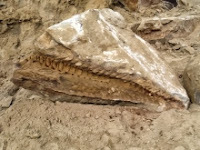 View of the dinosaur fossil that was found. 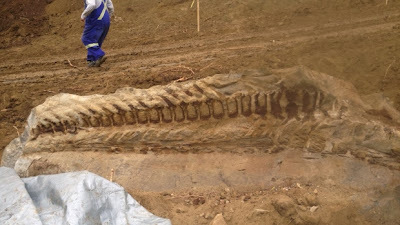 The 10-meter-long fossilized skeleton was found when a backhoe operator, working on the Tourmaline Oil Corp. pipeline installation, moved some earth and inadvertently broke off a piece of the fossil. Thinking he had simply chipped off a section of rock, the backhoe operator laid the piece to the side and turned to resume excavation work. That’s when he saw the exposed fossil in the embankment in front of him. An additional section of the dinosaur fossil. As soon as he saw the fossil, the operator stopped digging and the work on the site was shut down until experts could be brought in, said Art Wegner, speaking for the Acuren Group Inc.
Palaeontologists from the Tyrell Museum and National Geographic arrived at the site and will soon be joined by Pipestone Creek Dinosaur Initiative head palaeontologist, Dr. Matthew Vavrek. The fossil was found buried about 1.5 meters deep in the Saddle Hills area, southwest of Spirit River. CBCnews. Webpage consulted on October 16th 2013 - >LINK<.